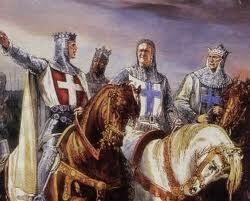 History of crusader swords. Swords of knights in Holy land. Templar swords – swords of Knights Templar. The swords used by the European Crusaders during the attack on what were known as the Holy Lands had become more than just crude weapons; possession of these swords conferred nobility upon the bearer, and it was such people who became knights for the Crusader armies. During this age, fighting was usually performed in mail armour, and latterly plate armour, with a shield on the off-hand. As a result, the swords carried by Crusader knights were single-handed, medium length longswords, usually with a straight, double-edged blade that tapered to a point to overcome the emerging plate armour encountered on the battlefield. As befitted the sword’s growing position as a status symbol, the swords of the Crusader knights were easiest distinguished by the design of the hilt and pommel. The simple cross-guard was curved towards the blade and the pommel bore ornate cross-shaped motifs representing the church under which the Crusaders served. Recently, the Crusader’s sword can be seen in the American Academy of Motion Picture Arts and Sciences’ Oscar statuette. The award depicts a gold plated knight holding a Crusader’s sword stood upon a reel of film. The Crusader design is still available from modern armouries today, sold as collector’s items. However, the design has long since become obsolete in modern armies where the sabre and similar designs found better favour. As a result, unlike the sabre, the design is not found in any national army’s dress uniform. 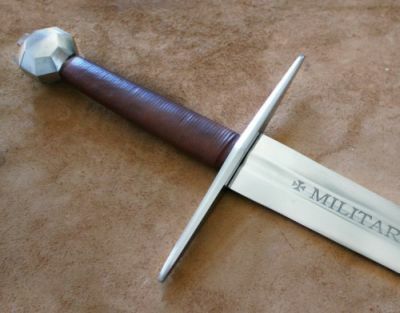 Crusader swords for sale – Templar swords, swords of Hospitallers and other knight orders.